On the next day after they lost Amami Tooru at the Dean Land. Katsuragi Keima, the ‘Capturing God’ dragged his feet and walked around on the street. His body was tilted forward, his shoulders were slumped, and he looked very listless. Keima sighed while still in his school uniform. After school, he came out without even changing his clothes. Beside him, Elsie was also in school uniform as she walked beside him. After saying that, she watched Keima in an apologetic manner. Keima said with a listless expression. Just when he just finished saying that. Elsie’s runaway spirit sensor suddenly had a reaction. Both Elsie and Keima were stunned. Both of them looked over. At the entrance near a shopping street, a girl was walking slowly in a horizontal manner at the arcade. To think that it was a completely different girl from Amami Tooru! Just when Elsie was panicking, another change happened. The runaway spirit detector again reacted. This time, it was in a completely opposite direction. Elsie and Keima instinctively turned around. Keima couldn’t help but bemoan. Elsie looked lost as she said that. In the corner on the opposite side, at a place directly opposite from where the girl was, Amami Tooru was walking alone. She didn’t seem to realize what was going on here. Elsie flailed her arms about. She looked up at Keima and waited for his decision. Keima quickly made his decision, and immediately after thinking, instructed Elsie. After saying that, Keima ran away to chase after that unknown again. And thus, she ran off in the opposite direction. Keima’s judgement was simple. One simple point; Amami Tooru and Elsie knew each other. In other words, Elsie could get Amami Tooru to stop even after chasing after her. However, in contrast, Keima had no information on this unknown girl he was facing, and he could only check her situation out personally. Only Keima could say hello to her or call her. Thus, Keima let Elsie chase after Amami Tooru, and he went to chase after the other girl. Luckily, the girl was walking in a rather casual piece, and even Keima could catch up successfully. (Even so, Keima was already panting hard). Soon after, Keima saw her back and frowned. The girl who heard Keima’s footsteps, and what she said when she turned around stunned Keima. Keima was shocked, and stopped. Keima would hardly interact with other people at school. Whether it was during break time or lessons (and even PE lessons! ), he would always be holding his handheld games and playing his bishoujo games, so he became a weirdo to the rest. Keima himself wouldn’t talk to girls in real life who he thought were imperfect existences, and the girls would tease him as an Otomegane who only knew how to play games from day to night, and no one would try to interact with him actively. That wasn’t the case. Katsuragi Keima had an exceptional memory. Keima could still remember these girls name if there was a chance where he would do duty together with someone or when someone was called by the teacher to do something. Keima also remembered the other personal particulars of this girl. Keima knew all these, but. Keima’s response lagged for several moments, but was extremely quick. He shook his head. He continued to observe Yoshino Asami, and was perplexed. It was tough, there was no clues at all. There was nothing that gave her the ‘beauty’ impression like Amami Tooru. It wasn’t like ‘cute’ or ‘active’, but even so, she did have a mouth, and she’s not expressionless. There were a lot of girls who made fun of Keima, so it’s rare to see someone like her take the initiative to talk. But it wasn’t like she had feelings for Keima, and it wasn’t out of loving compassion. Her dress attire was normal too. Everything was normal, everything was plain. This expression was normal too. She wasn’t a sportsgirl, and he never heard that she was rich. She looked like she liked to read books, but it’s not like this literature girl didn’t have a mouth. She wasn’t a fighter, and yet not an idol. She didn’t avoid Keima, but wasn’t especially close to him. Plain, the sort of feeling when she would talk to a classmate when she’s on the way home. Keima felt extremely troubled as he was walking beside Yoshino Asami. Up till now, the experiences he had showed that those with a runaway spirit would have obvious traits, either good or bad. For example, being very eccentric or being very aggressive. Then , he would take on these traits, find a gap and tackle them. But this Yoshino Asami was way too ordinary. A shocking contrast from the ‘Denpakei’ Amami Tooru Elsie should be chasing now. Yoshino Asami answered as she walked. All these were too plain. To Keima, it might be better if she tried to avoid him or even feel disgusted by him. Thus, he tried a little jab in his words. He deliberately made a mischievous expression. Yoshino Asami didn’t really have any special response. She answered in an extremely ordinary manner. It felt that there’s a wall between him and Yoshino Asami, but he wasn’t clear about what this thin wall was about. This wall that gave an ‘extremely normal response’ was a troublesome one. Yoshino Asami smiled as she said and waved her hand. She sounded so calm even at the end. She walked into a bungalow that was opposite. It was really a standard bungalow amongst standards. After looking at this bungalow that didn’t have any unique feel to it, Keima could only shake his head. It doesn’t feel like there would be any benefit for him to continue looking at Yoshino Asami’s house. 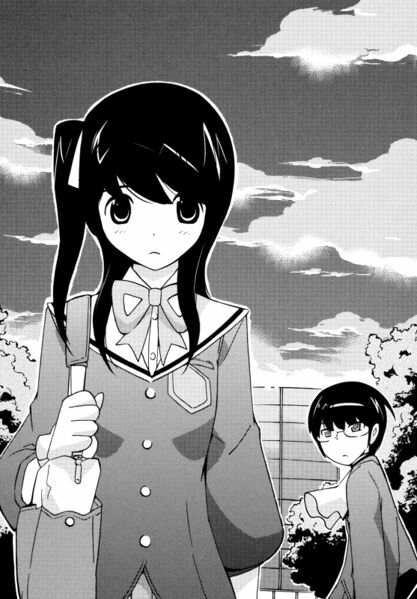 Anyway, the girl with a runaway spirit was Keima’s classmate, and he confirmed her residence. It was fruitful as compared to Amami Tooru, who he didn’t know anything of. Now he should met up with Amami Tooru and Elsie first. As he made this decision and was about to step forward, Keima suddenly realized something. Yoshino Asami should be in school today. However, Elsie’s spirit detector didn’t have any response to it. He suddenly stopped in his tracks. As he was talking with Yoshino Asami up till now, he didn’t realize that there was a small old bookstore beside her house. The type where they were placed like a wagon sale. Keima’s eyes than sharply noticed a few magazines that were placed on the shelves of the wagon. Keima really couldn’t ignore them. He took a few books that were lined up with a heavy expression and started browsing. Even if he wanted to buy them, he had to check their contents. A lively voice came from next door, and a girl jumped out. Keima suddenly lifted his head. And after realizing that Keima was behind her, she showed a surprised look. She smiled as she said that. Yoshino Asami was stunned for a while. And then she showed a mischievous smile. The impression Yoshino Asami gave others had a huge change. Was it because she was wearing plainclothes? Or was it because she had makeup on. Unlike before, she looked really energetic. Just 10 minutes ago, as she entered her own house, it felt like she was wearing clothing of ‘equal value’ which gave an impression of not have any special characteristics. But now, she was giving off a vibrant and energetic vibe. Yoshino Asami lifted her eyes slightly and said with an impish-like sweet voice. She became a really cute, really charming girl. Before he even knew it, he was sitting down at a nearby sweets shop and having tea with Yoshino Asami. The first floor was of a wooden open deck, and there was a blue umbrella covering them from above. The table and chairs were of the more delicate kind, and it was a cafeteria with quite the sense. The shop attendants uniforms were cute too. Yoshino Asami said some pointless things. Once he recovered, he continued to observe the girl. Characters. Basically, he’s taking down girls in a galge manner, so to Keima, it wasn’t about ‘personalities’, but ‘character’. Dual characters would mean that the girl had two different ‘characters’. Like how she would look proud in front of others and yet look so humble when it’s two people. Or when the girl’s normally capable, but would act like a bumbling onee-san in front of the protagonist in a mero mero manner. The biggest characteristic girl with such dual characters would be that they would have completely different responses and actions in a fixed situation. But it was too early to conclude that. The girl with a runaway spirit definitely had some problem. This problem is related to the girl’s actions and words. This was what he understood greatly after conquering a few girls. Like what Keima deduced, that this Yoshino Asami has dual characters, this trait of hers would have a direct relation to her problem. Keima recovered and looked at Yoshino Asami. And Yoshino Asami puffed her cheeks. After saying that, she continued drinking her iced coffee from the straw as she gave a mischievous expression. Keima smiled. His eyes were giving off a warm light. Yoshino Asami’s face went a little red. Keima frowned. He wasn’t unhappy, just a little shocked. She grinned and narrowed her eyes. Keima didn’t know what to answer. What was this girl worrying about? Yoshino Asami was so carefree, so worry-free. The strange wall he experienced when they went back home together disappeared completely. A soft voice came from beside him. On hearing this voice, his heart pounded wildly. It couldn’t be like this. It mustn’t be like this. As he turned around, he thought. In bishoujo games, there were often situations where the girls that were being conquered at the same time would appear at the same time to create a ‘Shuraba’ event. Based on the event, there would be a likelihood that the protagonist could create jealousy in the girls and move in further. However, if he ended up losing the trust of both parties, it would be a direct Bad Ending. It was an event which required very deli~cate decision making. Keima quickly looked at the expressions of the two girls. Was looking at Keima sadly. His heart was thinking that this was bad, that this couldn’t do, but he didn’t know what to say. Speaking of which, why was Amami Tooru here? Amami Tooru pointed at the street opposite the tea shop. It’s already hard for them to have an encounter, but she appeared here in such a scary moment. That’s why ‘Denpakei’ were hard to handle! At this moment, Yoshino Asami casually took out a notebook from her bag, ripped a piece of paper out and wrote a series of numbers with a pen she brought out. She blinked an eye lightly and stood up. Keima immediately tried to stop her without thinking as he stood up, but at this moment. Amami Tooru turned around wordlessly. To Keima, this reaction was way too awkward, but it couldn’t be helped. Was spinning at high speeds. Yoshino Asami and Amami Tooru. Who should he talk to? Who should he explain things to? Who should he call out to? Amami Tooru gave an icy expression that could scare Keima as she again wordlessly glanced at him. Keima couldn’t make an effective move before they left the terrace. Whether it’s Yoshino Asami or Amami Tooru, both of them left Keima alone at the tea shop. At this moment, Keima didn’t have any clue. If she had kept Amami Tooru busy well, this ridiculous event wouldn’t have happened.